Almost all modern automated machines and systems require precise, reliable and cost-effective linear measurement. And although this need increases in line with demands for greater efficiency, speed and quality, in reality, most common industrial applications do not require micron accuracy. The problem here is that most engineers seeking a reliable and sufficiently accurate linear measurement system, typically have few viable options. Most of today’s solutions are considered too expensive, too complex or are overly specified, while low-cost alternatives quickly reach their limits when longer measuring lengths are required. Factors like these apply to systems such as scales, potentiometers and magnetostrictive systems, among others. Many optical systems, while offering high levels of accuracy, are often over specified and too costly for the task in question. Most common industrial applications do not demand accuracies of a thousandth or even hundredth of a millimetre. Also, in terms of environmental performance, the susceptibility of optical systems to the ingress of contaminants can be an issue. With potentiometers, factors such as extreme temperatures, vibration, wear and susceptibility to foreign matter are all well documented issues, while magnetostrictive systems also suffer from temperature effects, as well as sensitivity to shock and potential inaccuracy over distances of less than 100 mm. With the shortcomings of existing solutions sometimes precluding them from use in particular applications, there is a need for alternatives. One such measuring system, which has emerged more recently, is Sensoflex SFI-plus from Parker Hannifin. Simple in design and able to provide a resolution of 0,1 mm, this new technology can match the requirements of many common positioning operations. The possible objection, that this measurement accuracy is insufficient, overlooks the fact that in most cases no higher accuracy is required. Typical applications to benefit include conveyor and storage technology, lining work on wood or plastic machines, automatic cut-to-length machines, and worktables and transportation carts. Designed for both linear and rotary motion, Sensoflex SFI-plus operates reliably within pneumatic, hydraulic and electrical systems. 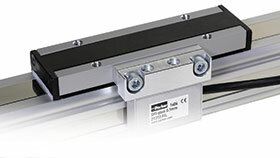 Two principal components make up this contactless magnetic length-measuring system: a 10 mm wide, self-adhesive magnetic scale and a reading/sensing head with connection to an external control unit. Contactless and wear free, scanning is carried out magnetically. In terms of operation, the read head converts the magnetic poles into electrical signals that are processed by downstream counter inputs, using a PLC, PC or digital counter. Two pulsating, 90° out-of-phase counter signals (phase A/B) are provided with a 0,1 mm resolution. Signal integrity is maintained even at travel speeds of up to 10 m/s. The cost-effective nature of such a solution stems from the fact that the scale itself is little more than a magnetised strip of tape stuck to the mounting surface. Further economies are achieved through quick assembly and minimal time required for wiring. This new concept in linear measurement also meets many other common application demands. For instance, the system is compact as it can be mounted directly on the actuator profile, while flexibility is derived through straightforward integration in existing systems. Universal application is facilitated through a choice of drive technologies and the fact that the system is suitable for almost any control or display unit with a counter input. User friendliness is enhanced via variable measuring lengths up to 32 m, the only requirement being that the scanning head is also able to cover the entire travel distance. Lastly, the system is resistant to both vibration and impact, and offers a degree of protection to IP67. High-accuracy solutions are not only expensive, but often require careful installation. Additionally, the adoption of such systems might not be possible in many applications because of factors such as vibration or differential thermal expansion. Here, the lack of robustness of high-accuracy solutions can lead to failure or malfunction. Ultimately, the best strategy is to specify an approach that accurately reflects the needs of the application – performance beyond that is unnecessary.